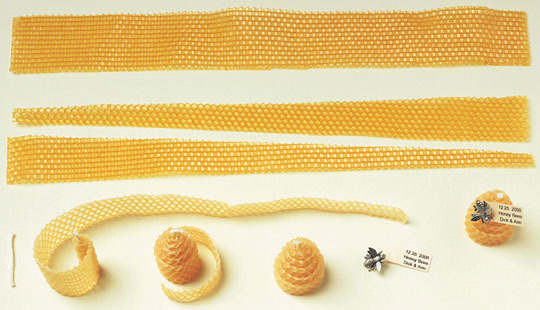 These elegant beeswax candles can be made quickly and easily with just a few materials from your craft store. 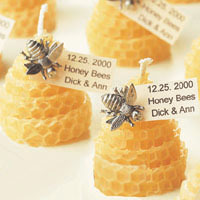 This project is from the book Beautiful Wedding Receptions (Leisure Arts Book #15890). You will find more creative favor ideas in our books Favors (Leisure Arts Book #3390) and Creative Wedding Keepsakes (Leisure Arts Book #15904). Copyright © 2003, Kooler Design Studio, Inc.
Beeswax sheet, 8" x 16"
Personalized paper label, 11/2" x 7/8"
Cut beeswax sheet into four 2" x 16" strips. Beginning 1/2" from one corner, cut each strip diagonally; refer to photo for shape. Cut candle wicking into 21/2" lengths. Attach labels to tops of candles, using a pushpin.